Philadelphia Eagles fans certainly won't miss Chip Kelly offensive series that were three plays in duration and were over by the time you got back from your trip to the bathroom on a commercial break. That said, one thing the Eagles almost never did offensively under Kelly was waste timeouts because the play clock was running down. Wasted timeouts were a common occurrence from 1999-2012, when one Mr. Andrew Walter Reid was the head coach in Philly, and they're probably coming back. 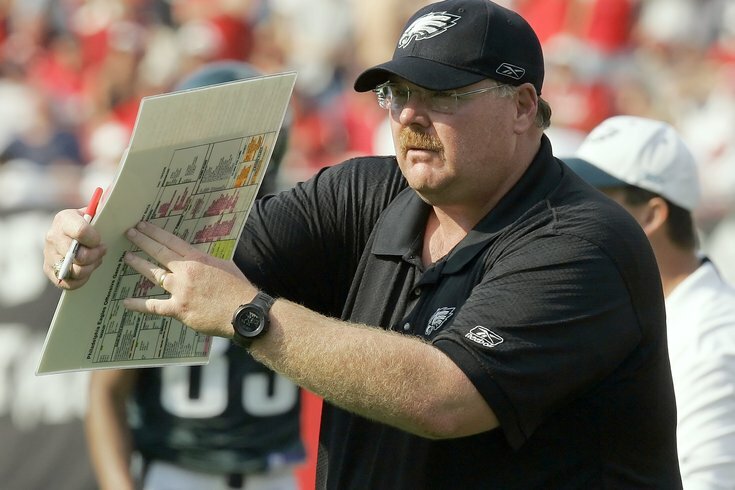 In the last three years in Kansas City, Andy Reid (mostly) would call the plays, and they employed a two-step process getting the play call to the huddle. Reid would give the play to former Chiefs offensive coordinator Doug Pederson, who would then make the call to quarterback Alex Smith on the field. Unquestionably, the "whispering down the lane" approach cost the Chiefs at least a few extra second pre-snap on every down. The HC-to-OC-to-QB approach to play calling will be following Pederson from Kansas City to Philly. Pederson will make the play call to offensive coordinator Frank Reich, who will then make the call into the quarterback on the field. Pederson disagreed that the process is cumbersome. @JimmyKempski Jimmy...it would be interesting to find out how many time outs were wasted by the champion Broncos. Still, ideally, Pederson could just communicate the call directly to the quarterback, but he explained the necessity behind it. It's mildly interesting -- although certainly understandable -- that Pederson wants to be in on what the defense is doing, and he is choosing the defensive channel over the quarterback channel. Pederson explained why. To be clear, Jim Schwartz will run the defense and make all the calls. “I oversee the entire team, but structurally, what he puts in on defense, I’m not going to change," said Pederson. "Yes, I’m over all of it, but at the same time I’m not going to go say, `Jim, I think you need to blitz more or blitz less." Pederson will be able to hear what the defense is doing, but the benefit of that will probably come at the cost of the Eagles wasting some timeouts on offense, just like in the good ol' days. Pederson will need to do a better job there.